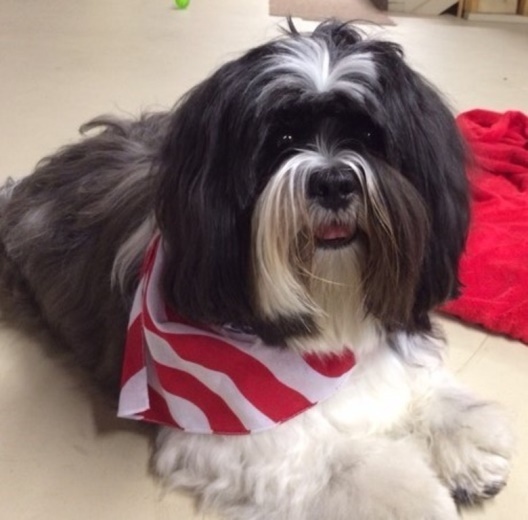 Jan Stevens, an ALAC member and longtime Lhasa Apso owner, describes Casey’s Therapy Dog visits to her local hospital. I enjoyed reading about Casey’s reaction to the patients and visitors at the hospital and their reactions to him! He is truly an all around companion! 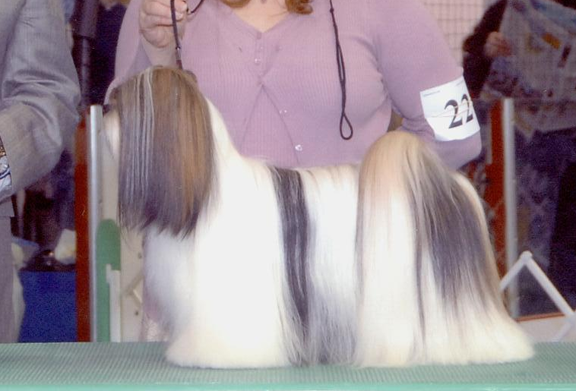 Casey’s breeder, Roberta Lombardi, reports that Casey was the ALAC Regional Specialty Winners Dog in 2012 under breeder judge Keke Kahn. Casey is progressing so beautifully in his role as a therapy dog. He seems to look forward to our Tuesday afternoons at the hospital. He dances with excitement by the back door as I load his crate and stroller into the car. We visit for 2 hours and see about 50 people including patients, visitors, and staff. Many of the staff members have gotten to know him and call out his name when they see him. He loves the attention. He has turned tears into smiles on several occasions. People love to feel his coat and marvel at his “braids” and his long, soft hair. I get lots of comments about how calm he is. He behaves as if he knows he is an official ambassador to make people happy. And now that we have been doing this for a while, Casey’s silly, playful side is started to show, especially with the staff members. He likes to show off his prairie dog pose for them. After our first visit to the hospital in June, I decided to get a stroller for him. It’s easier on him and me as we make our rounds. I also feel that it keeps him cleaner even though I’ve found the hospital floors to be very immaculate (one would hope that in a hospital). I always maintain full control of him when we visit. 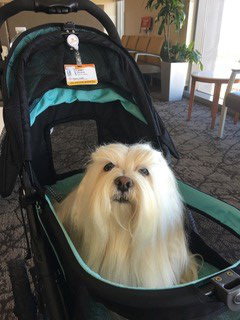 He greets people from his stroller or I hold him for them to pet him. In a couple of the staff rooms, I let him walk around and he goes from person to person like he knows he is to say hello to each person. Initially I was concerned that his coat might get messed up with all the petting, but thankfully that hasn’t been a problem. A couple weeks ago he met a 7+1/2 month old baby. I pulled Casey’s stroller up along side the baby’s and they were both so cute. The baby had a smile and big eyes full of surprise and amazement. And Casey was gently smelling the baby. He must have experienced that special baby smell. Casey got his AKC Therapy Dog Novice title in September. 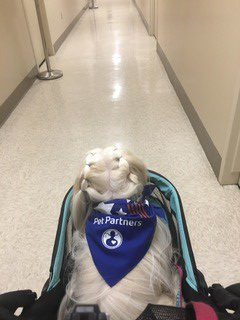 After 50 visits he will earn his full Therapy Dog title. He has 21 visits now, so I expect we’ll get to 50 by spring. When I received his THDN certificate, I was surprised to receive an Achiever Dog certificate as well. I guess that’s something new that AKC is promoting for dogs receiving 3 or more titles. Casey now has CH, THDN, and CGC titles. I marvel at how well Casey has gravitated to his role as a therapy dog, almost like this is what he was meant to do at this stage of his life. He has surpassed my expectations. I’m grateful that he is happy and healthy and enjoying life. Maestro is owned by Bobbie Wood, breeder/exhibitor/trainer/AKC Judge and Sarah Fitzgerald. 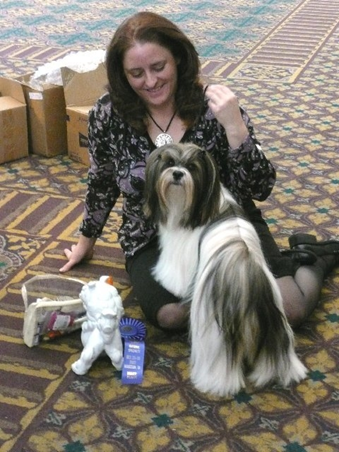 Maestro is the very first Lhasa Apso to earn an AKC ScentWork title…Scent Work Container Novice! 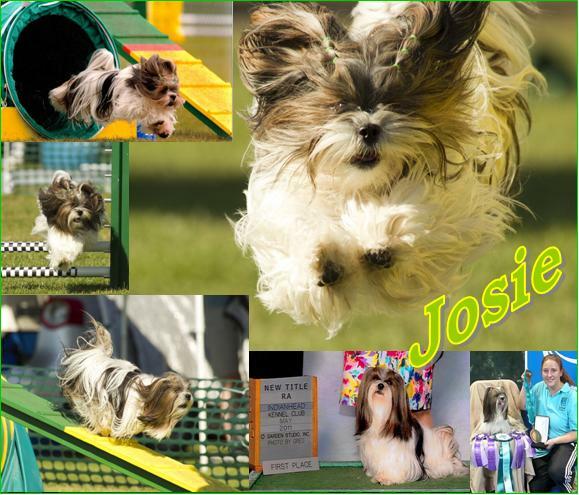 He also has obedience, rally, CGC and trick dog titles. Most of these titles are earned in agility. 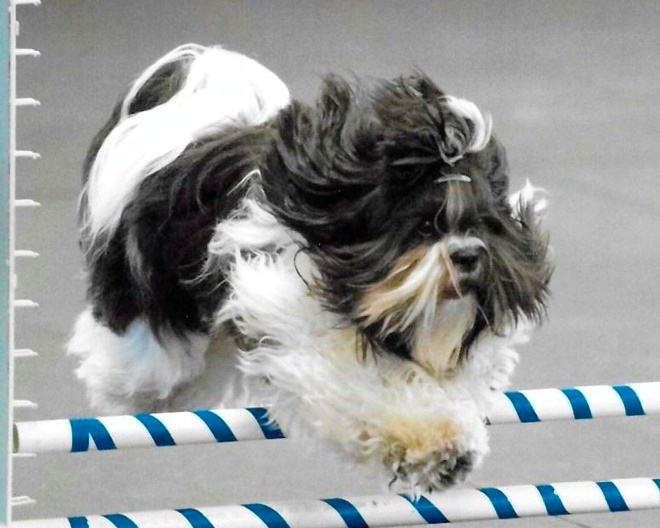 For example the MACH = Master Agility Champion and requirements are: In order to acquire the title, a dog must achieve a minimum of 750 championship points and 20 double qualifying scores obtained from the Master Standard Agility class and the Master Jumpers With Weaves class. Coco is owned and trained by Sue Ridgley. I have really enjoyed this journey with Coco. He is our fourth Lhasa since 1971 and they were all really good dogs, but much different one from the other in personality. I started training Coco when he was a 13 week old puppy, the day we brought him home from Karen's. I first started him in puppy school for socialization. He was sooo scared he hid under my chair for the first three weeks. After that 6 week class, we started "formal training" at the Decatur Obedience Training Club, an AKC affiliated all breed club. 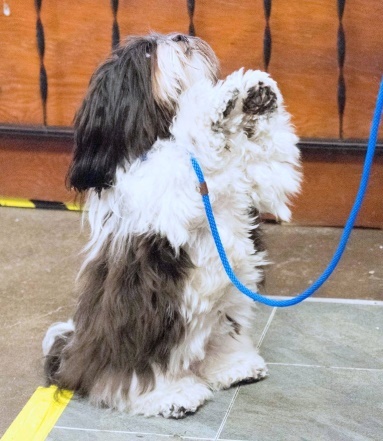 DOTC offers traditional obedience as well as agility and other dog sports. After taking a second class, I became a member. DOTC needed a newsletter editor, so I volunteered. Coco became the "featured" editor for each newsletter. 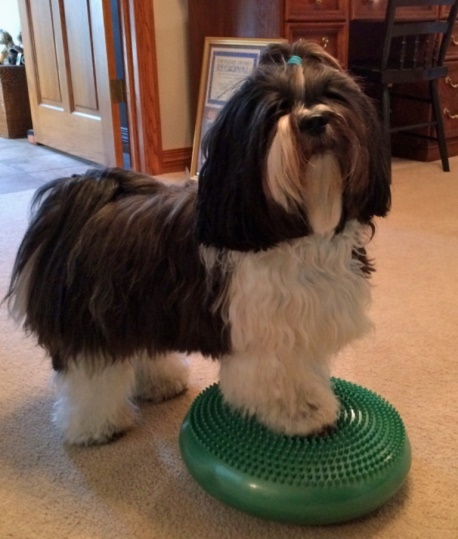 Lhasas are wonderful dogs who respond well to food treats (the right ones), toys that squeak or pull and playing. They can seem "stubborn", but it's just their independent streak coming out, I think. They aren't just in to pleasing you and don't do things just because you command it, but if you make it really fun and get excited, they do too. When I call Coco away from something in the yard, I run away from him and yell and cheer and he stops and runs excitedly towards me and when he gets to me we run together and enjoy each other! He's so much fun! 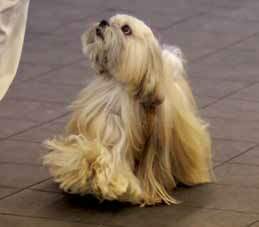 Thanks a lot for recognizing what a great dog Lhasas are. Truly a gift from above. He's usually a little faster, but it passed, so I guess it was ok. The requirements are 10 tricks from the Performer and Advanced lists by AKC and a story to go with it. Coco won his TDCH in October of 2016 and it was grandfathered in to AKC for the TKP title (Trick Dog Performer).